Despite being a one-set movie (virtually all the action takes place in the same location, much like a stage play), and despite its low-budget origins (it was released straight-to-DVD in February 2010), Lo has received generally glowing reviews from the small number of people who saw it, with lead actors Roberts and Birkett, and makeup designers Tom Devlin and Kazuyuki Okada being singled out for special praise. Another element of the film which works very well is the score by young American composer Scott Glasgow, who has slowly been making a name for himself in the independent and low-budget film music world over the last few years. Glasgow is a former student of John Corigliano and a former assistant to composers such as Bruce Broughton and Christopher Young; his work on CD has been championed by labels such as Intrada and MovieScore Media, who released earlier works such as Hack, Bone Dry, Chasing Ghosts and Toxic to general acclaim, despite the fact that they accompanied films so far under the mainstream radar as to be almost invisible. 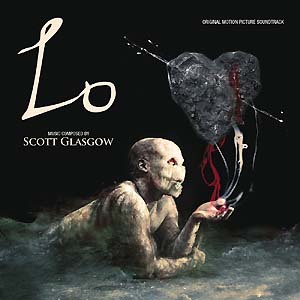 Lo could very well be Glasgow’s best work to date, and if heard by enough people could lead to bigger and better things. Written for a medium sized orchestra (augmented by samples, a result of the film’s budgetary constraints), and featuring violin solos by Mark Robertson and piano solos by Glasgow himself, the score oscillates between moments of darkness and horror, and moments of lighter, almost comedic fare, highlighting the absurdity of Justin’s situation and the verbal sparring between himself and the mischievous, malevolent demon. This alternation between darkness and light, comedy and horror, seriousness and triviality, is the score’s defining quality; one minute you’re listening to what sound like subtle variations on nursery rhymes, or beautiful lilting love themes, the next you’re delving into the mind of a demonic figure with music to match. Often, you’re experiencing both sounds simultaneously, where the purity of the melody is usurped by a twisted undercurrent that adds a new dimension of uncertainty to the score. It is this constant shifting of tones, of never knowing what’s coming next, that makes the Glasgow’s music for Lo so interesting. A clear influence on the music is French composer Camille Saint-Saëns, especially his famous 1872 work “Danse Macabre” with its lugubrious Paganini-style violin melodies, waltz-time pacing, and slightly sinister overtones. Subtle allusions to the piece appear in several cues, notably “Face to Face”, and it receives a full performance in the fifth cue (“Avec des Interruptions”), but it is Glasgow’s original work which makes for the most fascinating listening. After a cacophonous minute or so of dissonant buildup, “Summoning the Demon, Lo” emerges into a creepy Kilar-esque march punctuated with clever choral effects, ranging from a whispering/chanting male voice choir to a solo female soprano and guttural throat singers growling down in the depths of the mix. The music relating directly to Lo and his interactions with Justin often has this duality, a sense inquisitiveness and playfulness that just barely teeters on the right side of anarchy and downright malevolence. Although he’ll argue with you, talk to you, even share a wisecrack or two, Lo is not a demon to be messed with. This idea is worked in to many of the score’s subsequent cues; “The Demon, Jeez” presents a strident, lolloping string theme which bounces all over the place, while “The Power of Lo” and “Demon Fight” are probably the score’s most challenging cues, moving from a brutal cacophony sound in the former into a staccato action piece in the latter. Many of Glasgow’s instrumental choices are clever and inventive, and although a fair amount of the score is quite textural and creepy, Glasgow often introduces unexpectedly light touches to keep the listener off balance. The harpsichord and glockenspiel duet in “The Possessed Hand”, and the plucky percussion effects and bold rhythms in cues such as “Talking to the Hand” and “Lo Plays Games” are both amusing and unsettling, and are not too far removed stylistically from the menacing classicism of Elliot Goldenthal’s Interview With the Vampire, or the music Danny Elfman wrote for scores such as Beetlejuice back in the day. Accordions make a guest appearance in “Recitative & Silhouettes”, while in the mind-bending “Edge of Sanity” snippets of both Glasgow and Saint-Saëns’ themes briefly peek through what is otherwise a chaotic collision of sound. The clever thing about this cue is the way in which the fleeting fragments of thematic music seem to appear in reverse order, working back through the album, as if Justin is unraveling events in his head, trying escape from Lo’s mental grasp. It sounds like a chaotic mess, but in actual fact the structure of the cue is very well-defined. However, the most popular parts of the score will surely be the cues in which Glasgow’s thematic writing or Robertson’s classically strong violin performances rise to the fore. Cues such as “Gift of the Magi(c) Book”, have a surreal sense of timeless innocence, with a delicate and pretty music box theme bookending a playfully droll tuba march augmented by frothy pizzicato strings. Later, cues such as “Love, Misunderstood”, “Justin Takes Control”, the gorgeous “Duality”, and the sublime “Love Theme from Lo” showcase both Glasgow’s hitherto unheralded talent for writing beautiful romance, and Robertson’s exquisite performance techniques. It’s a shame that Lo isn’t a more high profile film, because Glasgow’s music deserves to be exposed to a wider audience than this project will allow. As has been the case so many times in recent years, it has fallen to Mikael Carlsson’s MovieScore Media label to uncover a high quality score from a relatively unknown film and present it to the world at large; the label is developing an enviable track record at this sort of thing, and is cementing its reputation as an invaluable resource for the film music community. Lo is just the latest in a long line of successes. As for Scott Glasgow, it only remains a matter of time before his music finds its niche in projects with greater commercial potential. He proves, with Lo, that he is a composer of skill and intelligence, who can easily step up to the next level, if only someone would give him the chance. Music composed and conducted by Scott Glasgow. Featured musical soloists Mark Robertson and Scott Glasgow. Recorded and mixed by Scott Glasgow. Album produced by Scott Glasgow and Mikael Carlsson.